Let’s talk first about what you see when you get this box. 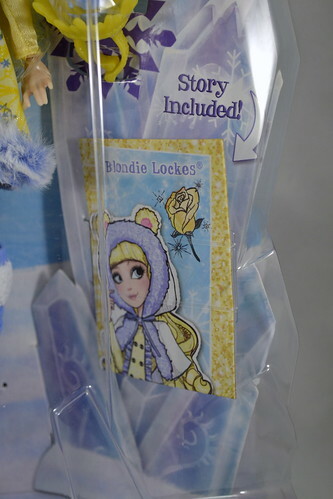 Blondie is packaged in the new Epic Winter box. It looks almost like a block of ice. 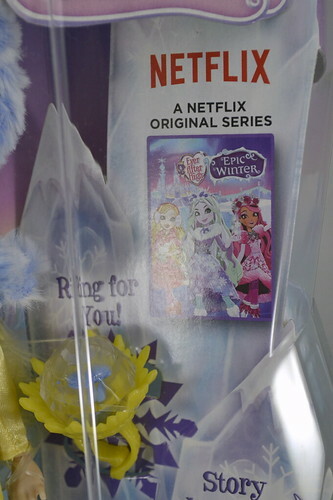 The cover of the new Epic Winter movie can be seen on the box, as well as a Ring for You!, a Blondie Lockes card that promises a Story Included! and the new logo. Photos of other dolls available in this set are also included. 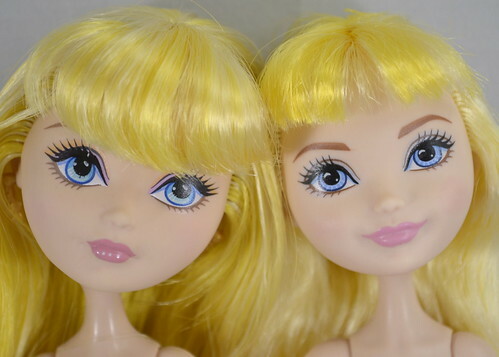 These were obviously prototype dolls, because the actual dolls have the new smiling faces. Here is Blondie with everything she comes with. Did you notice? There is no stand! Ugh. Missed opportunity. I’m assuming these are the deluxe dolls for the new movie? And no stand? 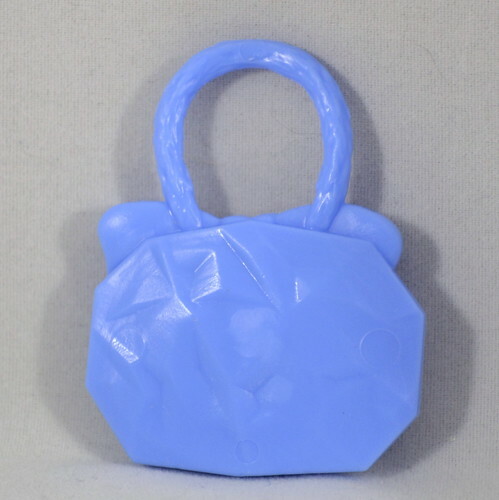 You could have totally done an adorable ice/blocky style for the stands. Or just give me a normal one. 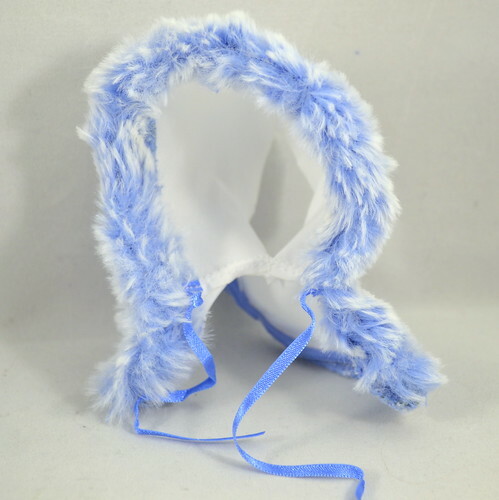 Blondie comes with this cute white hood with blue/white fur trim. This, added to the ribbon that ties it, makes it hard to see her face in the box sometimes. 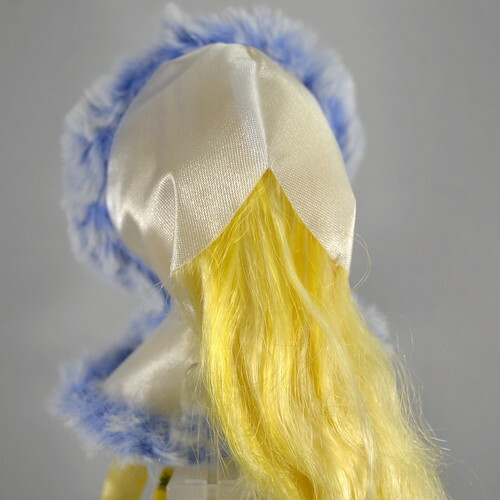 The hood has a hole in the back so that her hair can fit through. Do you see it now? Where are our cute ears!? We already get cheap fabric for the hood and no stand, but we don’t even get the cute ears! And did you notice anything else about this girl? Her eyes are so far from straight, it isn’t even funny. The great people at Toot’s Toys let me pick from multiple photos, but they said none of the dolls really looked all that good. In the right light you can even see where her eye was supposed to be printed….. but no. This seems to be a common problem with Blondie, though. I have a Signature doll that also has this problem. That eye on my right (the doll’s left) just doesn’t seem to ever print like the other one. Enough complaining. 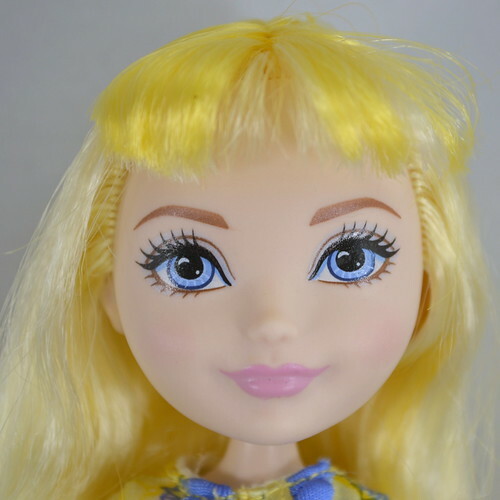 This Blondie has brown bottom eyeliner and lashes with brown eyebrows. She has a very faint blush. I can’t really tell if there is eyeshadow there or not. Maybe? Oh! and the big thing! Look at her smile! I’m actually a fan of mixing it up a little bit and including the expressions on the dolls. I mean look! The Signature doll just looks so mad in comparison. Blondie’s dress is kinda cute. It is all yellow with long sleeves and a yellow strip down the front. It has blue ruffles coming off of that strip. The other fabric has details that are printed on. The fabric is that cheap feeling stiff fabric. It might be because of the glitter…. It might be easier to see that glitter here. I’m getting spoiled with the clothes I buy on Etsy. This dress would be much cuter if the skirt portion was much more full. The trim is the same color as the hood, and that’s the most adorable part of it. I know the movie is about this EPIC cold that comes through, like in Frozen, but this dress would be much more cute with short sleeves. I mean, it’s already above the knee. It isn’t really keeping her from freezing to death. Oh! And I guess it’s worth noting. There are bows printed there The other items are all various snowflakes. The dress is all one piece. It could use a belt, I think. This is one of my least favorite outfits that Blondie has ever worn. 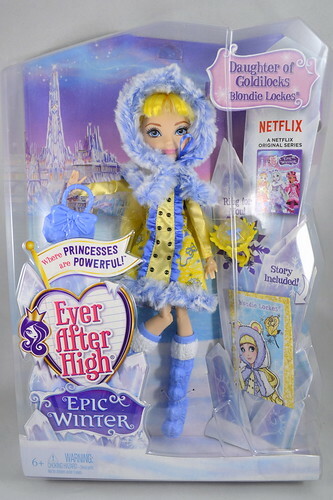 Blondie is the only Epic Winter doll (that I know of) that does NOT have molded/painted tights. See! She’s going to freeze to death anyways. Just give her a cute short-sleeved dress so she can freeze in style. 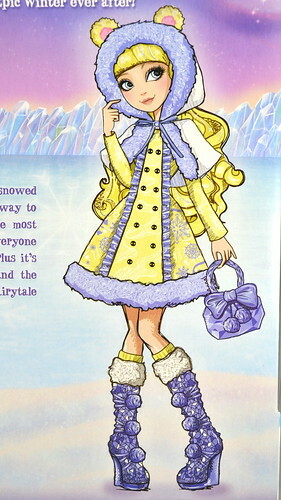 Her boots have cute little pom poms (that should have been painted… ugh) and this frozen/ice blocky pattern on the boot. There is a painted fur cuff at the top, at least. 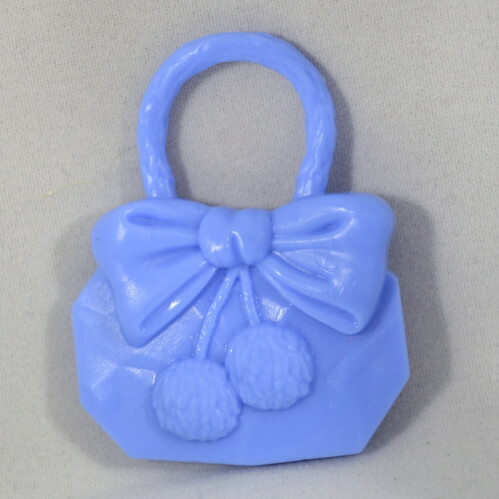 Her one real accessory is the block of plastic in the shape of a purse. It doesn’t open and is not painted. But hey! There is a bow on it! So at least there is something….. 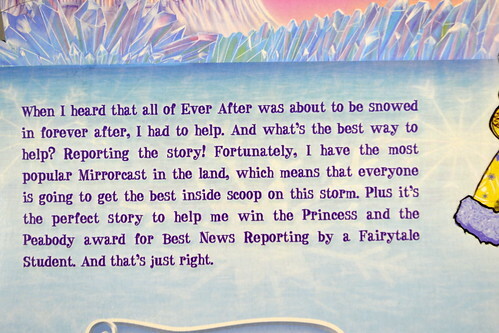 The other side of the card with the art features her “story.” Which is really just a card that doesn’t open. 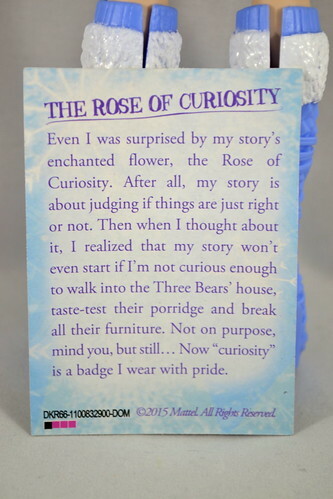 It tells about the Rose of Curiosity, which is her story’s enchanted flower. What is an enchanted flower? I guess we’ll have to watch the movie to see…. You get this ring for you. 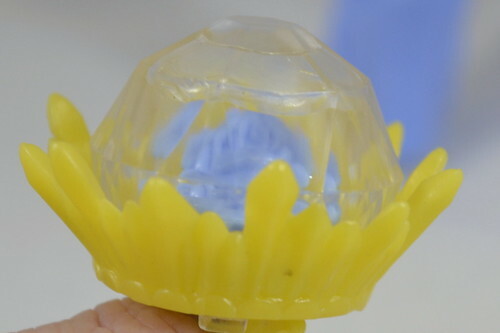 It is adjustable and can fit comfortably midway down my finger. I’m assuming that bit of blue inside is the Rose of Curiosity? …. I could probably keep going, but you get the idea. 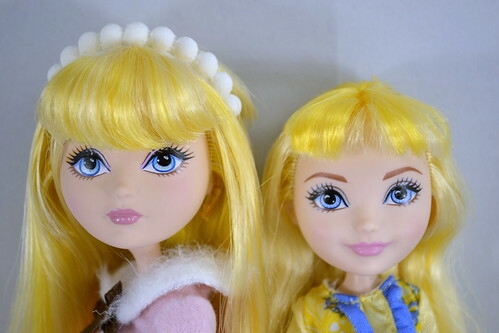 This doll left me looking more like the Signature doll, and less like the smiling Epic Winter doll…. What about you? 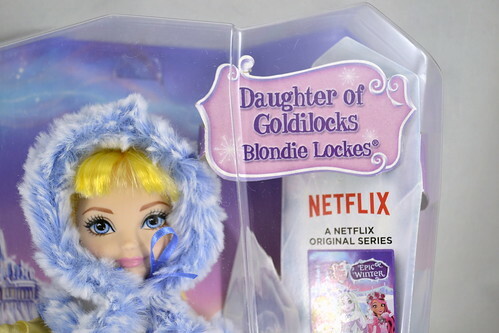 Will you be adding any Epic Winter dolls to your collection? Do these quality issues concern you? Or have you gotten so used to them that they won’t matter? Leave me a comment and let me know! Previous PostNew Epic Winter Dolls – Thanks to Toots Toys!Next PostIt’s been about 6 months…. Yeeeeah…I’m passing on this line. 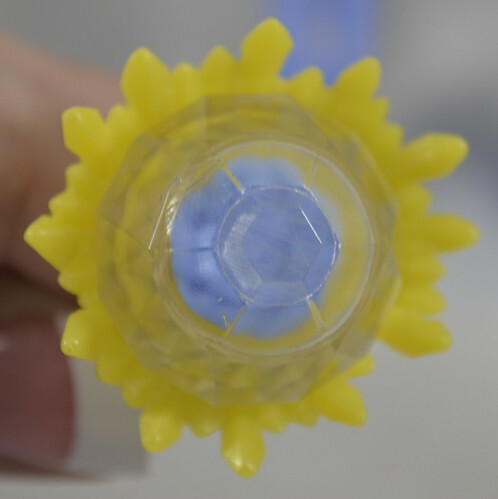 Crystal doesn’t even look good to me, so unless in person wows me…meh. I don’t even have the excuse of buying better quality dolls. Just the lack of details, the fact I’m pretty much a one doll per character collector and the quality I’m seeing is ug. Not a fan of stiff dresses. :/ Hate seeing lines I really liked going downhill like this…. I agree with 100%, I was going to get blondie from this line but they all look so lame… I’m just going to wait for birthday ball blondie now. I also only collect one doll of each character I like, which means I’ll have about 10 eah dolls when I’m done. I already got the package on Amazon that took a few months, it was worth it. 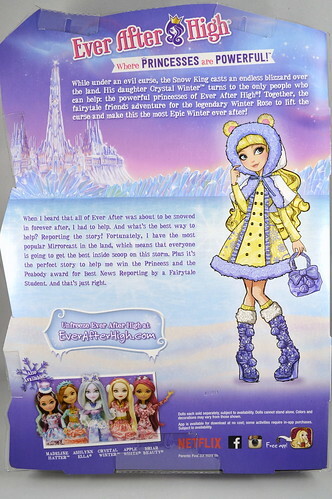 I’ll be getting Maddie, Briar, Ashlynn & Crystal from Epic Winter. I like Maddie’s smile, Ashlynn’s not so much, the others so-so. Some variation’s ok, but I wouldn’t want smiles all the time. Don’t like that the quality is declining, makes me wonder about future releases. I am a fan of the grin for some variation. I will be buying but most likely swapping the bodies because the molded legs are awful. I sadly am also feeling the decline in quality is leading towards a end at least for me. I LOVE the movies but the dolls are not what I have come to expect. Wow, what a disappointment. 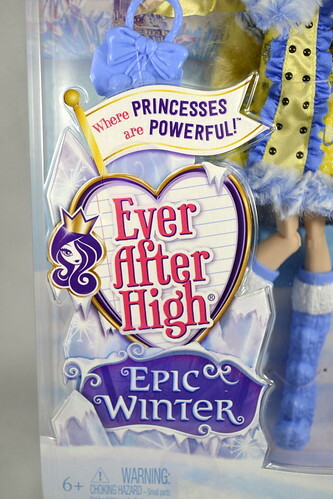 Not sure whether I will get any of the Epic Winter dolls now. I really don’t understand why they didn’t give her those ears. It would have been so adorable. I was already worried about this set TBH but now I’m cringing! 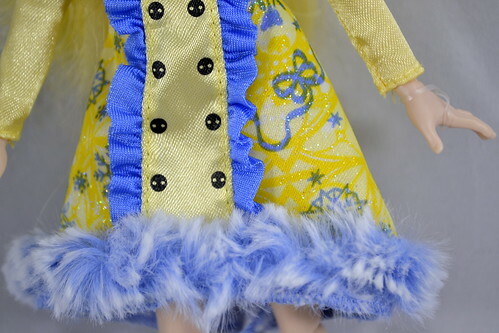 What I love(d) about EAH dolls was all the detail and the good quality. The quality has definitely taken a dive and headed downhill fast with this set. Its more like a budget line than a movie line. I think she’s cute, but…. meh… this line …. I’ll get them but only when the price drops. Too budget for my taste. Sig Blondie makes EP blondie look even cheaper. I like the normal not so smiley look , never been a fan of the big smile though I’m all for a bit of variation now and then . I just hope that all the dolls aren’t cheap and have huuuge smiles from now on. No stand, molded leggings..less accessories, no paint on the accessories, less hair… and don’t get me started on Daring. 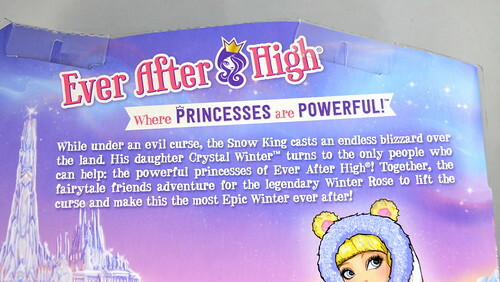 Mattel what on earth are you doing? this is your chance to outshine Disney with your quality, not go so cheap that even the Descendants line starts to look not so bad. EAH was always better. Pleeeaaase don’t let the quality slip so badly now. DG was awesome, all the past EAH dolls have been awesome. This line should have been awesome too with all those cute winter outfits!. I’m disappointed. I was disappointed that we didn’t get a Raven doll for this set, but seeing how the quality has gone down is worse. Thanks for the review Raye <3 I'm glad we know what to expect now so it wont be as much of a shock later. 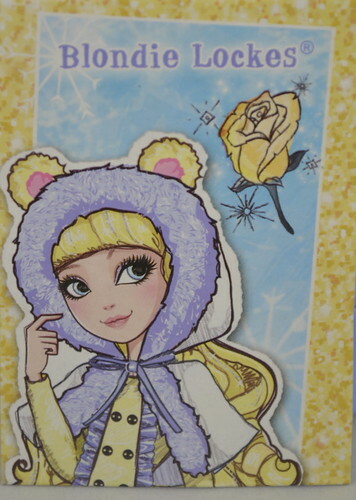 I'm sad Blondie didnt have those cute little ears on her hood as well! I think the line should have been named “Cute but Overpriced Winter”. I’ll be waiting until they are on sale. Do you think a 3D printed bear ear headband to replace the missing one might be in the future? I can totally work on that. We’ve got cat ears, so bear ears shouldn’t be too hard. I’m just thinking that you’d either have to cut the hood or put the headband on top of it. Well considering the ears in the proto pics looked plastic I’m sure a headband over the hood is how they did it. Tbh I think it would look cuter with her hood back and the ears directly on her head. 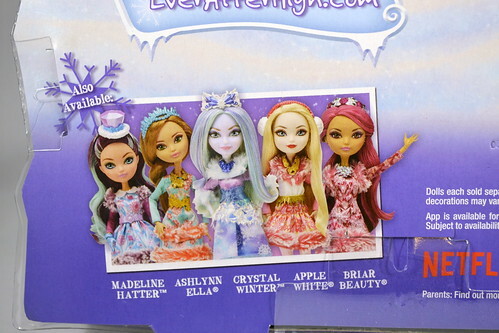 I’m wondering if maybe Apple and Maddie will end up better quality since they are a separate assortment. 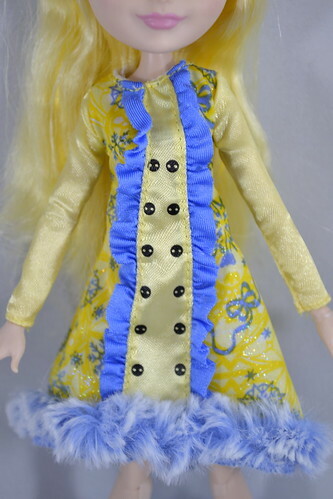 There was a picture of Maddie in her box on insta and while I couldn’t tell if she still had a stand or hair tinsel, she still had her belt and painted details on her accessories. no, really based on pics she might replace one of the Blondies I already have (2, and I don’t want to have more than that, so for now I’m trying to go “one in, one out” if I ever find another release I like). 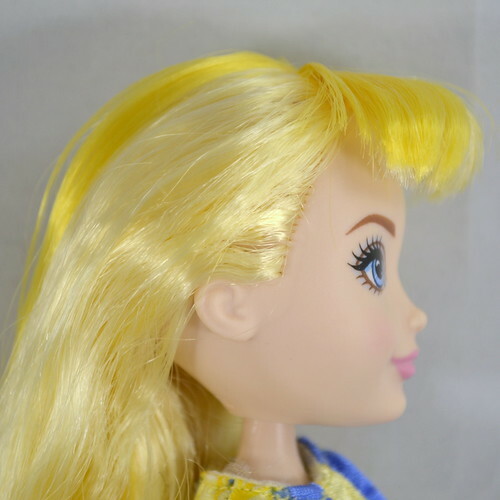 I would have preferred the bangs to be longer though, so I think if I ever get this doll I might rehair the bangs. besides this actual doll, the release in general is disappointing also to me. the lack of a stand seems ridiculous, and I was rather fed up seeing the coat is missing the bear ears, and the buttons are painted on… it just seems so… plastic.like, which is too bad, because that fluffy fur looks adorable. 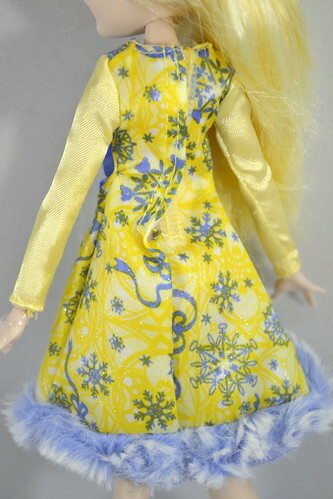 I would have also preferred the coat with reversed colours, in blue with yellow print, like this it is too yellow to me (and makes it more apparent tht the doll actually has yellow hair, not blonde). I really like coats and winter outfits/themes in general, so it’s harder to disappoint me with such a theme, still, I don’t like this one. Blondie was the doll I was most interested in picking up from this line, her coat looked really cute in the prototype images… but if she has sparse hair and eye wonk… nah. I think I’ll skip Epic Winter. How disappointing. Thanks for the review Raye. Seeing the quality issues of the latest releases I have actually gone back to get dolls from older lines vs. purchasing new ones. Seeing the nerfed Blondie just inspires me to make some winter clothes for these girls vs. buying them unless I can find them on clearance for their boots! What a shame. I really like her outfit but I don’t like that her hair are so flimsy. This is off topic, but do you know which EAH dolls share a skin tone with Maddie Hatter? Thanks for your help!